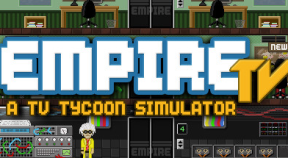 Empire TV Tycoon is a game in which you manage a TV channel and fight for audiences taking decisions that will project your channel to fame and fortune.You will decide the content of your channel, select advertisers, hire workers, make your own productions, hire actors, and engage in much more activities! It's inspired by games such as Mad TV, Mud TV, and other movie management games, with a modern approach on how to produce custom content such as movies or tv-shows. Empire TV is a big corporation having serious losses, and It can't afford to maintain three channels, but only one, any longer. You have been hired to lead one of the channels to achieve fame and be the one that remains. Don't be tempted to use illegal content. While pirated movies are cheaper, the risk is high and police is always watching.